This is “Using Research as Support”, section 8.1 from the book Public Speaking: Practice and Ethics (v. 1.0). For details on it (including licensing), click here. Understand three reasons we use support in speeches. Explain four criteria used to evaluate support options. In public speaking, the word “supportThe range of strategies a public speaker can use to develop the central idea and specific purpose by providing corroborating evidence.” refers to a range of strategies that are used to develop the central idea and specific purpose by providing corroborating evidence. Whether you are speaking to inform, persuade, or entertain, using support helps you create a more substantive and polished speech. 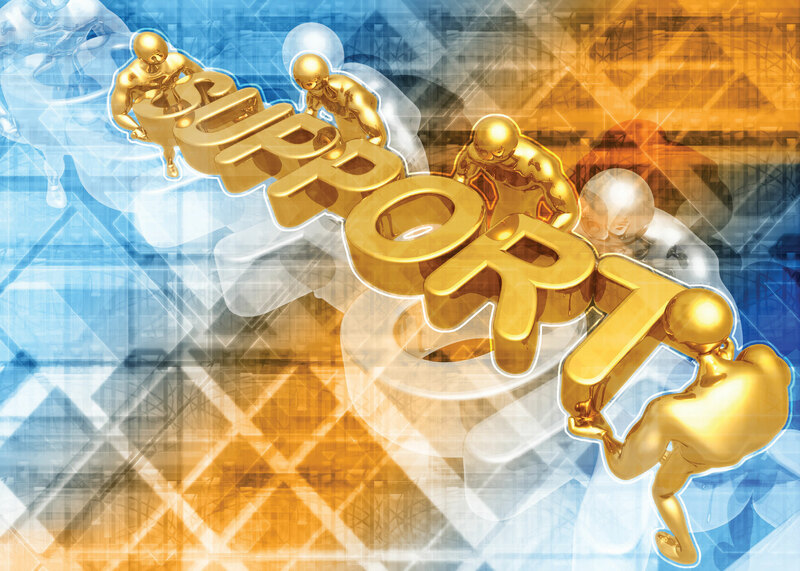 We sometimes use the words “support” or “evidence” synonymously or interchangeably because both are designed to help ground a speech’s specific purpose. However, “evidence” tends to be associated specifically with persuasive speeches, so we opt to use the more general term “support” for most of this chapter. In this section, we are going to explore why speakers use support. Speakers use support to help provide a foundation for their message. You can think of support as the legs on a table. Without the legs, the table becomes a slab of wood or glass lying on the ground; as such, it cannot fully serve the purpose of a table. In the same way, without support, a speech is nothing more than fluff. Audience members may ignore the speech’s message, dismissing it as just so much hot air. In addition to being the foundation that a speech stands on, support also helps us clarify content, increase speaker credibility, and make the speech more vivid. The first reason to use support in a speech is to clarify content. Speakers often choose a piece of support because a previous writer or speaker has phrased something in a way that evokes a clear mental picture of the point they want to make. For example, suppose you’re preparing a speech about hazing in college fraternities. You may read your school’s code of student conduct to find out how your campus defines hazing. You could use this definition to make sure your audience understands what hazing is and what types of behaviors your campus identifies as hazing. Another important reason to use support is because it adds to your credibility as a speaker. The less an audience perceives you as an expert on a given topic, the more important it is to use a range of support. By doing so, you let your audience know that you’ve done your homework on the topic. At the same time, you could hurt your credibility if you use inadequate support or support from questionable sources. Your credibility will also suffer if you distort the intent of a source to try to force it to support a point that the previous author did not address. For example, the famous 1798 publication by Thomas Malthus, An Essay on the Principle of Population, has been used as support for various arguments far beyond what Malthus could have intended. Malthus’s thesis was that as the human population increases at a greater rate than food production, societies will go to war over scarce food resources.Malthus, T. R. (1798). An essay on the principle of population as it affects the future improvement of society, with remarks on the speculations of Mr. Godwin, M. Condorcet, and other writers. London, England: J. Johnson, in St. Paul’s Churchyard. Some modern writers have suggested that, according to the Malthusian line of thinking, almost anything that leads to a food shortage could lead to nuclear war. For example, better health care leads to longer life spans, which leads to an increased need for food, leading to food shortages, which lead to nuclear war. Clearly, this argument makes some giant leaps of logic that would be hard for an audience to accept. For this reason, it is important to evaluate your support to ensure that it will not detract from your credibility as a speaker. Here are four characteristics to evaluate when looking at support options: accuracy, authority, currency, and objectivity. Does the information within one piece of supporting evidence completely contradict other supporting evidence you’ve seen? If the support is using a statistic, does the supporting evidence explain where that statistic came from and how it was determined? Does the logic behind the support make sense? One of this book’s authors recently observed a speech in which a student said, “The amount of pollution produced by using paper towels instead of hand dryers is equivalent to driving a car from the east coast to St. Louis.” The other students in the class, as well as the instructor, recognized that this information sounded wrong and asked questions about the information source, the amount of time it would take to produce this much pollution, and the number of hand dryers used. The audience demonstrated strong listening skills by questioning the information, but the speaker lost credibility by being unable to answer their questions. The second way to use support in building your credibility is to cite authoritative sources—those who are experts on the topic. In today’s world, there are all kinds of people who call themselves “experts” on a range of topics. There are even books that tell you how to get people to regard you as an expert in a given industry.See, for example, Lizotte, K. (2007). The expert’s edge: Become the go-to authority people turn to every time. New York, NY: McGraw-Hill. Today there are “experts” on every street corner or website spouting off information that some listeners will view as legitimate. So what truly makes someone an expert? Bruce D. Weinstein, a professor at West Virginia University’s Center for Health Ethics and Law, defined expertiseKnowledge in or about a particular field or domains of demonstrable skills. as having two senses. In his definition, the first sense of expertise is “knowledge in or about a particular field, and statements about it generally take the form, ‘S is an expert in or about D.’… The second sense of expertise refers to domains of demonstrable skills, and statements about it generally take the form, ‘S is an expert at skill D.’”Weinstein, B. D. (1993). What is an expert? Theoretical Medicine, 14, 57–93. Thus, to be an expert, someone needs to have considerable knowledge on a topic or considerable skill in accomplishing something. As a novice researcher, how can you determine whether an individual is truly an expert? Unfortunately, there is no clear-cut way to wade through the masses of “experts” and determine each one’s legitimacy quickly. However, Table 8.1 "Who Is an Expert?" presents a list of questions based on the research of Marie-Line Germain that you can ask yourself to help determine whether someone is an expert.Germain, M. L. (2006). Development and preliminary validation of a psychometric measure of expertise: The generalized expertise measure (GEM). (Unpublished doctoral dissertation). Barry University, Florida. Table 8.1 Who Is an Expert? 1. Is the person widely recognizable as an expert? 2. Does the person have an appropriate degree/training/certification to make her or him an expert? 3. Is the person a member of a recognized profession in her or his claimed area of expertise? 4. Has the person published articles or books (not self-published) on the claimed area of expertise? 5. Does the person have appropriate experience in her or his claimed area of expertise? 6. Does the person have clear knowledge about her or his claimed area of expertise? 7. Is the person clearly knowledgeable about the field related to her or his claimed area of expertise? 8. When all is said and done, does the person truly have the qualifications to be considered an expert in her or his claimed area of expertise? When comparing the celebrity Jenny McCarthy to the blogger Orac, who do you think is the better expert? Were you able to answer “yes” to the questions in Table 8.1 "Who Is an Expert?" for both “experts”? If not, why not? Overall, determining the authority of support is clearly a complicated task, and one that you should spend time thinking about as you prepare the support for your speech. The third consideration in using support to build your credibility is how current the information is. Some ideas stay fairly consistent over time, like the date of the Japanese attack on Pearl Harbor or the mathematical formula for finding the area of a circle, but other ideas change wildly in a short period of time, including ideas about technology, health treatments, and laws. Although we never want to discount classic supporting information that has withstood the test of time, as a general rule for most topics, we recommend that information be less than five years old. Obviously, this is just a general guideline and can change depending on the topic. If you’re giving a speech on the history of mining in West Virginia, then you may use support from sources that are much older. However, if you’re discussing a medical topic, then your support information should probably be from the past five years or less. Some industries change even faster, so the best support may come from the past month. For example, if are speaking about advances in word processing, using information about Microsoft Word from 2003 would be woefully out-of-date because two upgrades have been released since 2003 (2007 and 2010). As a credible speaker, it is your responsibility to give your audience up-to-date information. The last question you should ask yourself when examining support is whether the person or organization behind the information is objective or biased. BiasA predisposition or preconception of a topic that prevents impartiality. refers to a predisposition or preconception of a topic that prevents impartiality. Although there is a certain logic to the view that every one of us is innately biased, as a credible speaker, you want to avoid just passing along someone’s unfounded bias in your speech. Ideally you would use support that is unbiased; Table 8.2 "Is a Potential Source of Support Biased?" provides some questions to ask yourself when evaluating a potential piece of support to detect bias. Table 8.2 Is a Potential Source of Support Biased? 1. Does the source represent an individual’s, an organization’s, or another group’s viewpoint? 2. Does the source sound unfair in its judgment, either for or against a specific topic? 3. Does the source sound like personal prejudices, opinions, or thoughts? 4. Does the source exist only on a website (i.e., not in print or any other format)? 5. Is the information published or posted anonymously or pseudonymously? 6. Does the source have any political or financial interests related to the information being disseminated? 7. Does the source demonstrate any specific political orientation, religious affiliation, or other ideology? 8. Does the source’s viewpoint differ from all other information you’ve read? As with the questions in Table 8.1 "Who Is an Expert?" about expertise, you don’t have to have all “no” or “yes” responses to decide on bias. However, being aware of the possibility of bias and where your audience might see bias will help you to select the best possible support to include in your speech. In addition to clarifying content and enhancing credibility, support helps make a speech more vivid. VividnessA speaker’s ability to present information in a striking, exciting manner. refers to a speaker’s ability to present information in a striking, exciting manner. The goal of vividness is to make your speech more memorable. One of the authors still remembers a vivid example from a student speech given several years ago. The student was speaking about the importance of wearing seat belts and stated that the impact from hitting a windshield at just twenty miles per hour without a seat belt would be equivalent to falling out of the window of their second-floor classroom and landing face-first on the pavement below. Because they were in that classroom several times each week, students were easily able to visualize the speaker’s analogy and it was successful at creating an image that is remembered years later. Support helps make your speech more interesting and memorable to an audience member. The strategies a public speaker can use to provide corroborating evidence for the speech’s central idea and specific purpose are called support. There are three primary reasons to use support: to clarify content, to increase speaker credibility, and to make the speech more vivid. A good piece of support should be accurate, authoritative, current, and unbiased. Find an article online about a topic on which you are interested in speaking. Examine it for the four aspects of effective sources (e.g., accuracy, authority, currency, and objectivity). Do you think this source is credible? Why? Find a speech on the Vital Speeches of the Day website (http://www.vsotd.com) and try to identify the types of support the speaker utilized. Is the speaker’s use of support effective? Why or why not?